The Milky Way and Andromeda are on a collision course and they will smash together in the distant future. Now the European Space Agency’s telescope Gaia has refined the measurements of Andromeda’s speed and the merger is expected to begin in 4.5 billion years, about 600 million years later than previously expected. Gaia is taking detailed observations of billions of stars in the Milky Way to measure their position and speed, but its instruments are so sophisticated that it can track stars even in other galaxies. 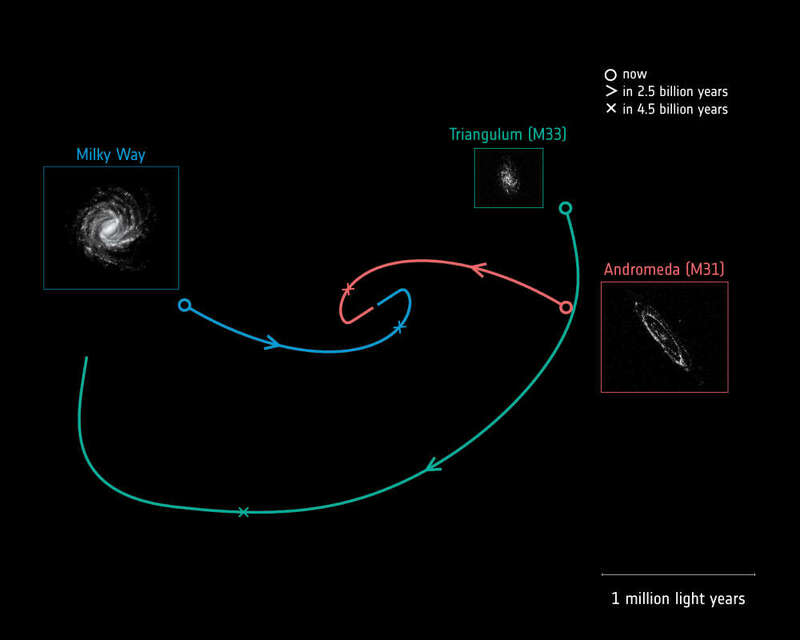 Researchers have used the data from the mission’s second data release to study the movement of Andromeda and another close-by galaxy, Triangulum. The findings are reported in the Astrophysical Journal. Triangulum and Andromeda, also known as M31 and M33, are two of the main galaxies in the Local Group of galaxies. Together with the Milky Way, they make up most of the Local Group’s mass. Armed with the data from Gaia, researchers were able to estimate that the first interaction between our galaxy and Andromeda will be more of a glancing hit than a head-on collision. By tracking massive bright stars, the astronomers were also able to work out the spin of these objects, the rate at which they rotate on their own axis. This is a measurement that researchers have been working on refining for a century. The observations also showed how Triangulum is moving around Andromeda. In the past it has not been clear if M33 had already performed a flyby of M31, or it was just starting to fall in. Now, astronomers have worked out that Triangulum’s velocity can only be explained if this is the first time it’s coming close to Andromeda.